I am pleased to be able to provide a forum for a significant insider in the area of Balinese medicine to introduce you to this fascinating and little known area of spiritual practice and healing. Ms. Morris has had the unprecedented opportunity to be accepted into the inner traditions of Bali and has been taught at the highest levels. We are also pleased to be able to reproduce two excerpts from Ms. Morris's new book, Gurus and Geckos. 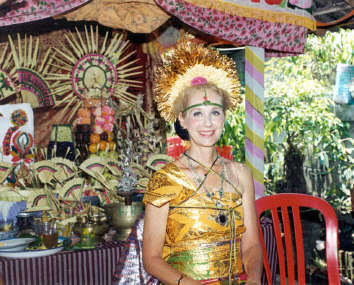 A June 29, 2004 interview with Ms. Morris by Laura Lee can be heard via streaming audio by clicking on the following link: Donna Jean Morris talks about Balinese medicine. You will need Windows Media Player. An Excerpt from Gurus and Geckos. Copyright © 2001 Donna J. Morris; All Rights Reserved. Tat twam asi. You are that. Three words from ancient sacred writings in the Upanishads, form not only the core of Balinese spirituality but extend outward to their vision of man, nature, the universe and beyond.At the most profound level, all that exists within human beings, all that exists upon the earth, all that exists within the universe are of one and the same essence. Additionally, it is the belief in Bali that the specific elements in nature of fire, water, earth, air and space dwell harmoniously within precise areas of the human body. As counterparts of nature, the characteristics of each element are mirrored within the human body as a microcosm. The macrocosm is the universe. Always in fluid movement between poles of natural oppositions, the universe and all elements within it including humans strive or move continually toward an ambient equilibrium, the delicate but ever-changing point of balance. These ongoing changes, shifts or fluctuations form the cycles, which occur throughout existence rotating between concepts such as creation and destruction, male and female, light and dark, positive and negative. 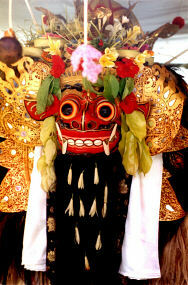 Balance is integral in all aspects of Balinese life. Applied to the concept of healing or medicine, illness is viewed as an imbalance not only within the individual physical body (jasmani) but imbalance of the spiritual body (rohani). Although Western medicine and physicians trained in the Western tradition are available in a few larger towns in Bali, it is often combined with traditional healing methods. Most prevalent throughout Bali, however, are a variety of natural healing methods and remedies derived from ancient esoteric texts and usage of an enormous variety of herbs and other natural materials. The key element is the ultimate balance of jasmani and rohani to achieve health. One of the traditional methods used in Balinese healing is through the sound vibrations created from chanting ancient mantras by a spiritual healer called a balian. Balians are always spiritual individuals, some may also be priests, priestesses (pemenkuh) or even pedanda, the exalted Balinese high priest. Prior to chanting any mantra, the balian must prepare extensively through meditation, purification and offerings. Pasuk Weturning Dasak Sare is the meditation used by a balian in preparation for healing. During the meditation, the balian visualizes the corresponding sacred character (aksara) for each of the nine directions entering into his body, thus becomes one with all the spiritual energies. For example, the aksara Sang, for the first direction, is the seed syllable for the Dewa Isware, the energy of emptiness, and is visualized residing in the heart, coming out of the east as white light. Balancing the male energy is the female energy of Dewi Ume, the energy of all plant life. Both are moving upon the vajre is a sacred mystical bell, and as a weapon its power is that of sound vibration, thus sound removes obstacles preventing or disrupting the assimilation of the spiritual energies. All elements now move, in visualization from the heart, into the whites of the eyes, then into the skin over the entire body, and lastly out of the body in all directions forming a shell consisting of millions of white, Sang aksara, each containing all the elements listed within the mantra. After completed the entire set of nine directions, the energy or essence of each is alive and residing within the body of the balian. In the conclusion of the meditation, the balian visualizes another aksara, called the Onkare Ngadegand Onkare Sansung, residing upon the entire body, melting into the body, dissolving into the back of the throat where the Onkare Ngadeg melts upward into the Onkare Sansung and becomes another aksara, the Pance Brahme residing at the tip of the tongue. Thus, all subsequent mantras proceeding from the mouth of the balian are imbued with all the sacred energies to bring them into being, alive and working toward healing the illness. For at this point, the Pance Brahme sits upon the tongue as the balian chants the healing mantras. The following is the complete PasukWeturningDasakSare, the mantra for meditation of the nine directions. It was given to me by Ratu Pedanda Gede DwijaKemenuh, one of Balis most respected high priests (pedanda) who is also a reknowned balian. He translated the ancient Balinese calligraphy into the Roman alphabet; the English translation is presented as well. Ring pepushan. Sangiyang Isware Dewan niye. Pada unsar udara tempat niye purwe. Setri niye Batari Ume Dewe. Mantran niye, Ang Ung Mang Ung. Isware your essence resides within my heart. From universal emptiness out of the East. Upon the sounds of Ngong Ngong. You move into the white of my eyes. You move into all of my skin. You merge with my spirit Atme. Upon your mantra Ang Ung Mang Ung. Ring ati. Sangiyang Brahme Dewan niye. Pada Unsar Panas tempat niye daksine. Mantran niye Ang Ang Ong. Brahme your essence resides within my liver. From universal fires out of the South. Upon the sounds of Ang Ang. You move into the red of my eyes. You move into all of my muscles. You merge with my spirit Tatuwatme. Upon your mantra Ang Ang Ong. Ring ungilan. Sangiyang Mahedewe Dewan niye. Pada Unsar Sinar tempat niye pacime. Setri niye Batari Raje Laksemi. Mahedewe your essence resides in my kidneys. From universal light out of the West. Upon the sounds of Ngerang Ngerang. Alongside the feminine Raje Laksemi. You move into the yellow of my eyes. You move into all of my veins. You merge with my spirit Suratme. Ring amperu. Sangiyang Wisnu Dewan niye. Pada Unsar Cair tempat niye mantrya. Setri niye Batari Dewi Sri. Wisnu your essence resides in my gall. From universal waters out of the North. Alongside the feminine Dewi Sri. Seated upon your black swan. You move into the black of my eyes. You move into all of my bones. You merge with my spirit Niratme. Ring tumpukaning hati. Sangiyang Siwe Dewan niye. Pada Unsur Padat tempat niye madiyane. Siwe your essence resides in my heart's vein. From the center of the universe and world. With your rainbow colored light. Seated upon your garuda bird. You move into the outer iris of my eyes. You move into my diaphram. You merge with my spirit Siwatme. Ring peparu. Sangiyang Mahesore Dewan niye. Pada Unsur Padat tempat niye genayan. Setri niye Batari Durge Dewi. Mahesore your essence resides in my lungs. From universal energy out ofthe Southeast. Upon the sounds Ngang Ngang. Alongside the feminine Durge Dewi. You move into the magenta of my eyes. You move into my breath. You merge with my spirit Keatme. Ring usus gung. Sangiyang Ludre Dewan niye. Pada Unsur Gergerak tempat niye neriti. Mantran niye Ong Ong Ong. Ludre your essence resides in my stomach. From universal movement out of the Southwest. Upon the sounds of Ong. You move into the orange of my eyes. You move into my blood. You merge with my spirit Antiyatme. Upon your mantra Ong Ong Ong. Ring limpe. Sangiyang Sankare Dewan niye. Pada Unsur Gelap tempat niye wayabiya. Mantran niye Eng Eng Ong. Sankare your essence resides in my spleen. From universal darkness out of the Northwest. You move into the green of my eyes. You move into my water. You merge with my spirit Paratme. Upon your mantra Eng Eng Ong. Ring ineban. Sangiyang Sambu Dewan niye. Pada Unsur Terang tempat niye ersania. Sambu your essence resides in my jugular vein. From universal brightness out of the Northeast. You move into the blue of my eyes. You merge with my spirit Niyoatme. Ring tumpakaning hati. Sangiyang Guru Dewan niye. Pada Unsur Padat tempat niye madiyana. Guru your essence resides in my heart's vein. You move into the pupils of my eyes. You merge with my spirit Sakweheingatme. Ah, ah, ah, Nirmale Gangge ye name. also preparatory for all meditation. Bute kale takut dan leyak. Nang, Mang, Sing, Wang, Yang. There are a number of different mantras a balian may utilize, depending upon the illness or affected body part. Some mantras are specifically for emotional or mental imbalances, some are related to imbalance in the body of the five elements of fire, water, air, earth and space, others are for general overall health. There are also mantras to balance a person within his environment, purify negativities, remove obstructions or clear an illness caused by black magic, sorcery or a spiritual origin. An example of an illness with a spiritual origin is something chronic, and not responding to any treatment that normally is effective, or a person with one illness that is cured but immediately replaced with another. Examples of the cause of an illness with a spiritual origin can occur if a person has been disrespectful to the Dewas in any way, disrespectful to sacred items, or disrespectful to ones ancestors. Additionally, the balian who omits the meditation is susceptible to receiving any sickness, negative energy or even black magic from the ill person. All the healing mantras are preceeded by the Pengusir Durge mantra. This mantra, which the balian repeats thirteen times invokes the spiritual energy of Dewi Durge for protection and clearing all negative energies around the ill person and around the environment. The balian may chant the mantra out loud or silently, with eyes open or shut and is most efficacious if combined with visualization of the mantra itself or the sacred characters (aksara) upon the ill part of the body. Of course, intense, focused concentration and intention to relieve suffering must always be foremost in the balian's mind. Each mantra has a corresponding minimum number of repetitions that must be executed, although it is always best to repeat more than the minimum. The balian's saliva may be placed upon the ill person at the end of the session, after all the mantras have been said, because by that time, the balian's entire mouth and saliva are infused with the essence and all the energies of the mantra. During a massage, each stroke may contain a mantra; each exhalation can contain a mantra as well as the balian visualizing the mantra or an aksara going out of the balian's hands into the ill person. 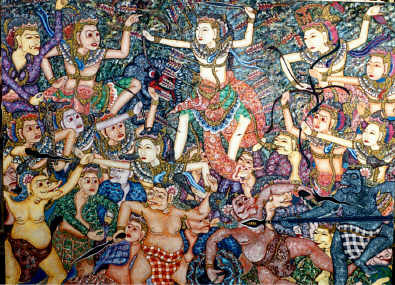 Also the balian may place healing mantras into oils or sacred water each of which may be incorporated for the healing. Because part of the balian's meditation pulled all of the spiritual energies into the eyes, they may also be utilized for healing. This involves great concentration and visualization of both the aksarasand mantras going out from the balian's eyes and penetrating into the specific area of illness in the sick person. Because the conclusion of the balian's meditation included the Pance Brahme aksara residing on the tip of the tongue, as well as the spiritual energies of Siwa residing in the diaphragm and spiritual energies of Mahesore residing in the lungs, the balian may choose to use the breath combined with mantra chants. This is done by blowing the breath after each mantra, visualizing the mantra and aksara on the breath penetrating deep into the persons area of illness. Often this technique is most efficacious if the ill person has fallen asleep. Any of the healing mantras may be said directly into a stick of incense, preferably sandalwood. The incense is thus imbued with the energies of the mantra and is used to heighten purification of the person, the environment of any negativites or illness. 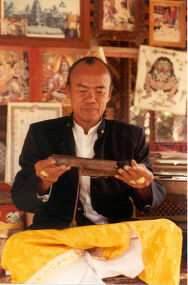 This technique may be used in conjunction with other mantras. Sacred characters (aksara) relating to specific illness or body parts may be drawn on a piece of rice paper, on an edible leaf, or directly into a glass of water, preferably sacred or consecrated water. It is best if the leaf has healing characteristics applicable to the ill person, however any edible leaf is acceptable such as basil, mint, or sage. The aksara is drawn by using a sacred implement that is only used for that purpose, and is dipped into either honey, orange juice or turmeric. The aksara can also be drawn on rice paper with a pen using non-poisonous ink. This last method is most applicable if the sick person is not immediately available for administering the drink. Transferring and/or joining the living aksara to a glass of water that the sick person will then drink. Any of the healing mantras may be said directly into a glass of water, or said into a flower that is then placed into a glass of water. Often a balian, if using flowers, will use flowers that correspond to the colors of the four directions such as white, red, yellow, black, or will use flowers with the most intense fragrance, such as frangipani. The water is either drunk and/or used as a bath by the ill person. 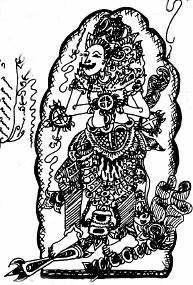 Some of the ancient lontar texts included complex drawings along with corresponding Balinese calligraphy that are used by balians to create amulets called jimats. Jimats are created for a variety of uses, healing is one usage. In constructing a jimat, the balian redraws the illustration, first asking permission to engage in this activity, then proceeding with focused intention upon the sick recipient. The illustration is usually drawn upon paper, although some are executed on white material or metal, depending upon the usage. Next, additional aksare are etched with a sacred tool onto a small piece of gold, silver, copper and bark of an indigenous Balinese tree. The balian folds the drawing in half, shaves incense into the crease then continues folding adding incense shavings with each fold until a small square approximately 1-1/2" is reached. The metals and wood are placed on top of the drawing with shaved incense in between each layer. The entire piece is slipped into a sheave of white cloth, then secured on all sides with threads. The jimats is then worn next to the skin by the recipient, who is instructed with additional information on the responsibilities of honoring, respecting and maintaining the live state of the jimats. If these instructions are not followed the jimats will cease to contain living energy. Only the pedanda can consecrate it once again. Because the jimats is created and consecrated specifically for one individual it can never be transferred to another.